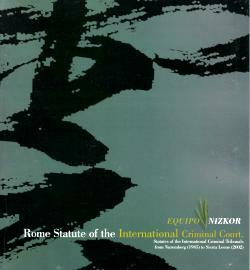 Equipo Nizkor - Rome Statute of the International Criminal Court. Compiled and published by Equipo Nizkor. 3rd. Edition English. Madrid, 11 November 2002. Updated Statute of the International Criminal Tribunal for the Former Yugoslavia. May 25, 1993 (includes amendments up to August 14, 2002). Updated Statute of the International Criminal Tribunal for Rwanda. November 8, 1994 (includes amendments up to August 14, 2002). Rome Statute of the International Criminal Court. July 17, 1998.